I love boots. I live in San Francisco where we can wear boots year round, since we have foggy summers and the weather is moderate. The boots above (please ignore that the laces are different colors) are from Avenue, they are a 9.5 wide. We were in Palm Springs in October this year for my 46th high school reunion and I went to Avenue and they had all these boots on display. I was in love. They had two pair that fit. The first one that fit had elastic for the entire back of the shaft of the boot which I was not crazy about, but I kept out just in case. 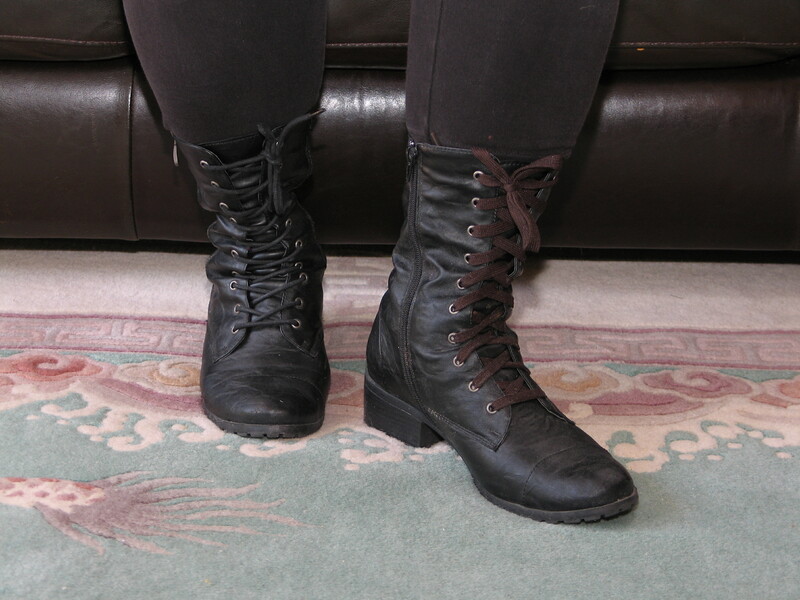 Then they brought out these combat boots, that lace up all the ways down into the instep, which is unusual, and my instep is high, but OMG they were COMBAT boots and I was born a pacifist, I do not even wear camouflage, even pink camouflage, I am such a pacifist. But they fit, and they were not heavy winter boots and I had to have them. One of the things I liked a lot about these boots is that since they are not wide calf boots, but are wide enough because I can lace them, they are not too large in the ankle, and thus provide a little more support. I would buy another pair of boots from Avenue any time, they feel good and they are plenty wide enough. They look a little like the Torrid Studded Boots I bought a couple of weeks ago….but I still want knee high boots.